The trick is you have to believe that you can and have your body fall asleep before your mind. In the astral realm, you can talk to anybody you want, just be careful. Focus on your third eye after you are relaxed and imagine pulling yourself out. Didnt watch the video.. But i can definitely do that. Out of body experiences. Ive had lucid dreams in which i can control myself since i was born, i thought everyone experienced that. My problem is that when i find myself asleep but "awake", i keep on forcing myself to wake up in this world. I REALLY dont want to abandon this reality, and i am scared about the fact that i am gone, in a way. Sometimes i wonder if i died and thats why im outside right now. I wonder if im in the hospital or God knows what and i freak out so i instantly pour myself back in my body(thats how it feels when i am close to it). When i am sure that i am not dead, that i will surely get back to my body and that its "safe", okay... i will continue my trip. But right now its too much. Ive had it happen to me a few days ago. I guess that i had some business to do in the astral realm. I thought i was awake because i remember coming back from the city and walking around my neighbourhood. I slowly started to realize that i am dreaming because of some weird things around. I ran to my building and when i got close to it, a mother and a child (unknown to me), greeted me: "Good day child of God". This never happens/happened ever where I live. In that moment, i froze. I wished her good day too but i was starting to panic really bad. (Am i dead?, am i in a freaking ambulance right now dying and im walking around the place freely?! Etc). I got in the elevator and waited to reach my floor. As i got closer, i felt like i was pulled on a side, like i was sucked in a tunnel really quickly. Then everything went black. I relaxed because this always happens when im "pouring" myself back into my body. If you are scared in this process you are likely to get blocked/wait ages until you get back. Anyway, i relax and a few seconds later i wake up in my bed. My spine tingles, i am all numb but i feel my spine. Like its heavy. I got stuck a few times. Thought i was dead. Or during the process of falling back into my body when all is black. I GOT BLOCKED. Everything was black. There was nothing. I felt myself but i wasnt there. I could think but i couldnt in the same time. I was breathing but dead. I couldnt move. I couldnt do anything. But there are cool experiences too. I saw my guide once, and i guess thats cool? I was in my room, and i saw a woman floating next to my body. Of course that i freaked out. Again, i thought i was awake. She told me to calm down because she is here to help me. I asked her who she was and told me that she is my guide. I wanted to KNOW everything so i asked her whats her name. When she said her name, she pushed me back in my body and i woke up. Her name is Kyrios. I searched for it on that day and it means something. I SEARCHED AGAIN. IT MEANS MASTER. When i was 4-5, i believed (until now), that i would wake up in the middle of the night by myself. Each time, i found my mother sobbing in the kitchen, in the dark. I tried to comfort her but many times i would end up crying too. It happened A LOT and i really really thought that it was real. I discussed with my mother about that around this time (im 17). She told me that it never ever happened. But at that time, she was extremely depressed (she didnt show it and of course that 4 year old me had no idea). I guess that I saw her in the astral realm. Scary sad weird. Ilunatique, I have read about this, but have never experienced it myself. I've also been told about meeting one or more guardians within the astral world. I don't recall ever hearing about someone being blocked from going back into their own body! That's so frightening to me! The thought of having any of this happening is very scary to me...but I think that's the natural reaction most humans would have towards the experience. I've also heard about people trying to scream out in fright while in the astral world, but that it feels more like choking and there's no noise coming from their mouths. It's sounds as if this entry into the astral for you is not by choice, is that correct? 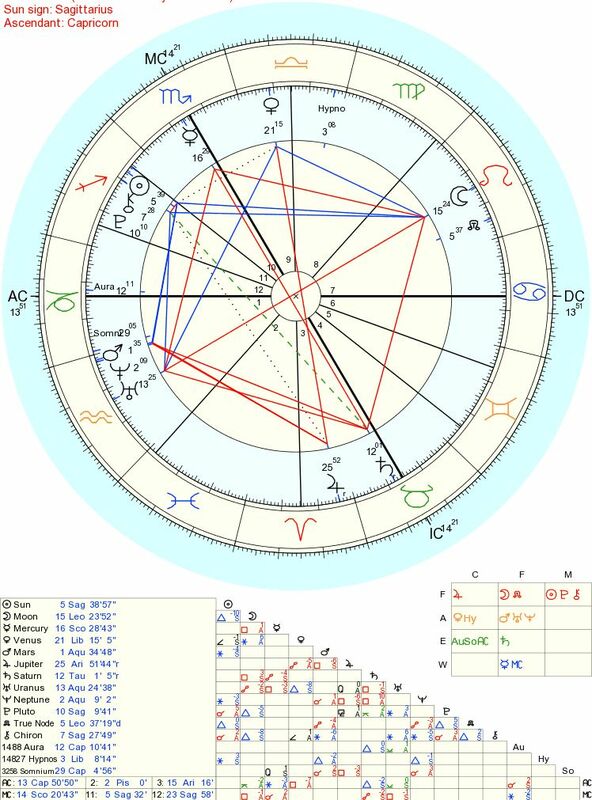 I would be interested to see your natal chart, if you don't mind sharing. In most of my experiences (lets say, 80%) i didnt see anything around me like guardians, entities, or whatever. Its rare. However, there is a specific room in my house that ALWAYS makes me have out of body experiences/sleep paralysis. Perhaps there is a portal? I am not sure, but that's the place where I saw Kyrios. I dont dare to sleep in that room ever again, i feel like there's something disturbing. After "waking up" in my bed while huge doberman shadows filled THE ENTIRE ROOM and sat watching me.... im pretty much done, thanks. Yeah. I was blocked both while falling back in my body (in pitch black) and while being next to it. I dont know why, because i am so used to this and its easy and quick for me to get back when I want to. You cant scream when you're a spirit, of course. It feels like a pressure to me, not really choking. Youre blocked. Blocked. Nothing happens. But you still do it..
Well, yeah. Its not by choice. But i can do it if i want to. (and i mentioned that meditation/self hypnosis- RELAXATION is very important here) You need to reach total relaxation, almost numbness with your eyes closed. When you feel that youre falling asleep (this is pretty difficult), you need to open your inner eye. You need to catch yourself and stay awake even if you are sleeping. I really cant explain this, sorry. Wow, I would guess aura on your asc has to do with these astral experiences. How fitting for you to include it with your natal. From what I have read about asteroid aura, it can bring both light and dark to us, but it's hard to control..and of course dependent on where it falls in our natal. That's really crazy about the one room in your house. I have no idea what to make of that except heavy spirit energy focused there. I think the "portal" itself resides within you, but that particular place may bring it about more quickly. Have you ever had this experience outside of your home? Thank you for sharing this info. My 6 year old son says when he dreams, he can see below him, like he's flying above the dream. He told me he "jumps" into other people's bodies in his dreams. Not sure what to make of that. I also had the same dream as him the other night. He said it vanished when he woke up but told me of the things in our dream that matched what I remembered. Yesterday night i decided that starting from today, i will sleep in that weird room. For a few days. I told myself that i will never go there again and sleep because i"ve had the most intense oob/sleep paralysis experiences + an entity messing around. But im ready for the fun. I cant wait. Im not really scared anymore. I just hope i wont get blocked. Oh wow! Well I would love to hear how it goes if you don't mind sharing. That does not sound like lucid dreaming; as much as it sounds like Astral projection; remote viewing; and OBEs. I also do lucid dreaming. Do you have any updates to share?